Drink on the street in style with this fab flask covered with vintage images taken from New Orleans public service signs. 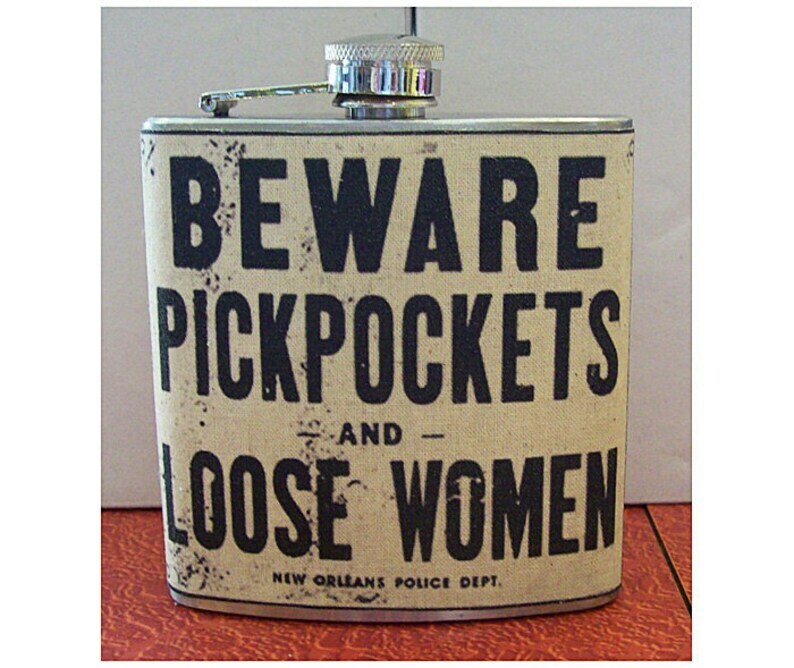 the front reads " beware pickpockets and loose women' and the back "All gamblers and fancy women". I make these babies with a brand new 6 oz stainless steel flask. I start by transferring the image onto lightweight canvas. I then apply 3 coats of scotch guard and adhere the canvas to the flask. The final result is a water and stain resistant product that will hold many a drink for your travels. As I usually make these to order it may take a few days after an order is placed before i will be able to ship. Colors are gorgeous - just as pretty as it appears in the photos! I would DEFINITELY buy from this merchant again! Very nice quality, quickly shipped. LOVED the whimsical packaging! The seller offered to bundle my multiple purchases and ship them together and then refunded me part of the shipping cost, which they did not have to do - to me, this shows what a quality merchant this is!